It’s here finally! 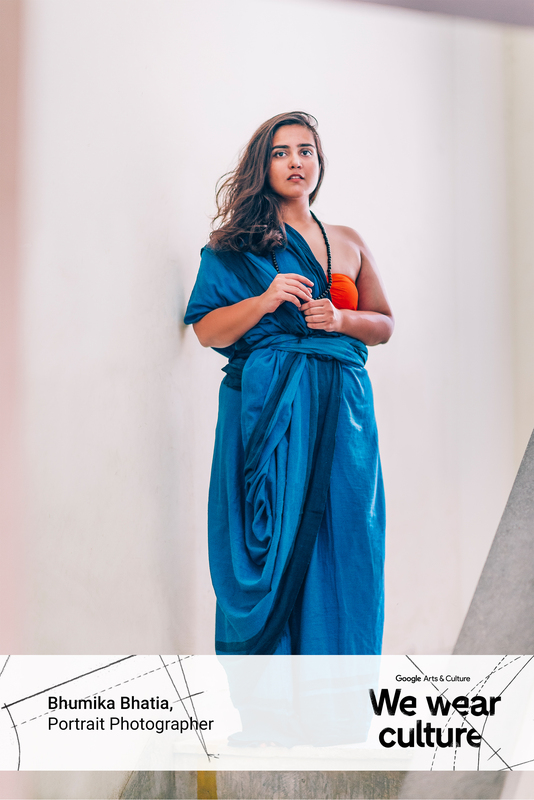 The #SareeOnMe #WeWearCulture photo project with Google India and Google Arts & Culture. The deal is that Google recently launched their Arts & Culture platform in a big way internationally. Google India has also included a ton of content and research from super talented teams. They also wanted to include real women who wear sarees and the project is called #SareeOnMe I came in as a photographer – the interviews and details about the sarees that you read below were all coordinated and managed by the agency. Props to Apoorva and Piyush and many thanks to all the women who were most gracious no matter where I asked them to pose – in the grass right after a rain shower, a slide in the park, in the bright hot Sun at Hauz Khas village in front of the pond, walking across a busy street, etc. This project was discussed for many weeks before things were finalized and took some more weeks to coordinate everything and proceed to the actual photo shoot. Three mad days of driving all over NCR photographing twelve talented women. They all wore sarees and I got to hang out with them and photograph them. With mad scheduling and re-scheduling of times and dates, everyone’s patience levels were quite amazing! Super kicked to finally publish the project on my blog and on social media. I don’t even know the number of people who have worked on the logistics of this project – lost count and probably didn’t even get to interact with each one. It has all come together today finally and I really like how it’s looking. 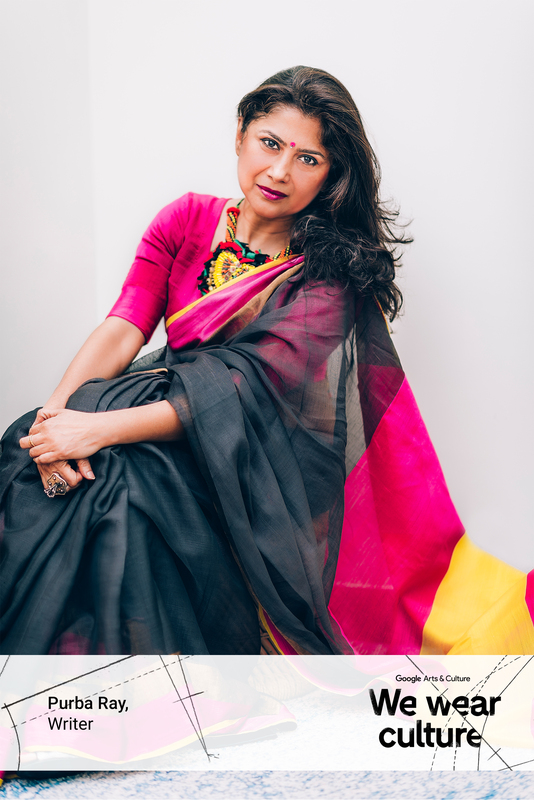 Here are the photographs that made it to the final edit, with introductions to the individual women and more details about their sarees. I turned the entire store(Byloom) in Kolkata,upside down to find THAT standout sari. Murphy’s Law dictates, what you are looking for will appear once you are about to die of disappointment. The funny thing is, once I bought it, I realised I had bought a similar sari just a couple of months back from Raw Mango. The fabric is soft cotton and drapes perfectly. It’s simplicity is offset by the deep contrasting colours. With special occasions, family and Durga Puja where Boudis furiously check each other out. Any other fun anecdotes related sarees in your life? When I started wearing saris to work, I’d drape it like a lungi. Yes, that’s how bad I was. My colleagues would take one look at me, roll their eyes, shut the cabin door and re-drape it for me. I also have a special talent for stepping on my own sari and stepping off when I hear a sickening fabric tearing noise. 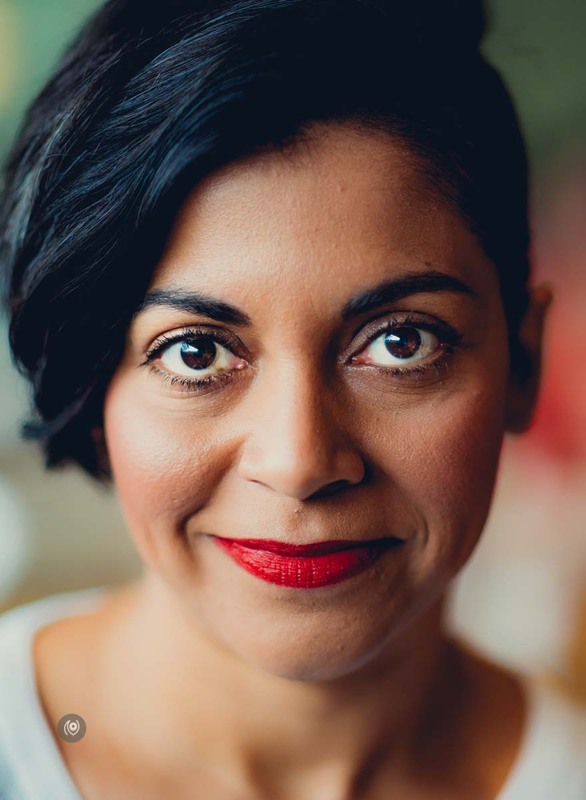 I am wearing a sari from one of the brands i love – péro Wearing it in the same drape as shown in the image on that link. Why I am choosing to wear this particular péro sari is one – I just got this and I can’t wait to wear it for a special occasion. As like many péro garments, it specialises in bringing together varied crafts, fabrics, hand skills onto one garment. The sari has floral print in pleats, striped border in two different colours, buttons and pom pom tassels, and a completely hand woven textile and detailing piece of garment. That to me epitomises “made in india” and “handmade with love” – two things i believe to be the future of fashion and clothing. To be honest, I love wearing the sari and wear it almost every Sunday #SariSunday and the idea is to interpret the sari with my own dressing sense. So while I learnt how to drape a sari from people I love, I wear it according to what I like and feel comfortable in. My major references and inspirations were at an early age browsing through my nani (grandmother)’s black and white images in her elegant saris. She is someone whom I find extremely nice, elegant and pretty. She also was very petite and thin, and for me to look like her in a garment was with the help of a sari – which has no size or fit. What kind of saree and drape are you wearing? Is there any special memory associated with this specific saree? Recently, I picked up two beautiful handwoven cotton sarees (orange-pink and blue-green in colour) which are created by weavers in distress in a small village called Bargaon – a quaint little village in the Barabanki district of Uttar Pradesh, around 40 kms east of the state capital – Lucknow. I also got an opportunity to meet up with the families during my visit to lucknow and how they work in such tough conditions. There is a story behind each thread. Mostly, family functions or weddings. If I could, I would wear sarees everyday and to work as well. Maybe I should try it out once. Haha! I love wearing my sneakers under the saree. It’s so comfortable! There was this one time when I was running around getting food for my friends who were wearing heels. I’m wearing my mom’s saree from Ritu Kumar and I’ve kept it very simple by draping in the most simple way. It reminds me of how I used to watch my mom drape sarees as a kid, I was too fascinated. The saree is my go to garment for special occasions like Weddings and traditional occasions. As a kid, I once tried to drape my mom’s saree but got terribly entangled in it, thankfully didn’t break my limbs. I’m wearing a contemporary saree with a dhoti salwar and crop top. The drape is a normal saree drape. This is a saree I wore once before when my sister came up with the idea of pairing the dhoti, crop top and a dupatta together to create a saree in 5 minutes. I had to urgently rush for a Diwali party and that’s when I adorned this contemporary look. People loved the look and I was surprised seeing what creativity in under five minutes can do. Replicated the same dupatta and dhoti for the shoot but chose a different crop top this time. Sarees for me are the garment in which girls look most elegant and beautiful. I wear sarees for wedding functions or any other occasion that requires ethnic wear to be worn. Makes me look taller too. I am wearing a soft linen sari draped in a classic traditional way. Paired with a crisp white shirt. Saree styling and draping has always been close to my heart. I’ve grown up seeing my Mom drape the most beautiful chiffons and I was in love with the chiffon saree at an early stage. With passing years I started experimenting with more fabrics and even made my Mom try them. We have a combined saree collection and that makes each piece special. The person who introduced the saree to me is my Mom. She’s the one who made me fall in love with them. I wear them anyplace from work to Fashion week. I get maximum social media love when I post an image wearing it! Fun! I’m wearing a Chanderi Meena Booti saree. Love front pallu styles, so I’ve tried to do the Gujarati drape here. Is there any specific memory associated with this saree? Not really, since this piece is from Kanelle’s most recent collection. The simple and elegant detailing just drew me in. I did see Vidya Balan wearing it sometime ago and she reminded me of a cool summer breeze – relaxed and beautiful. Growing up, when I would visit my grandmother (muma as I called her) during the summer holidays, we had this little ritual – she’d always let me make the pleats as she draped her saree. Even if I took ages because I wanted to get it just right, she’d wait patiently. Ever since, I’ve always thought that just the process of draping a saree is so ceremonious, how can one not feel special and beautiful wearing it. To be honest, until very recently I only wore sarees at weddings. But after seeing more and more of my friends bundle themselves up in eight yards of beautiful fabric and look so very chic, I’ve been pushing myself out of that comfort zone! Any other fun saree related anecdotes in your life? After getting the wrong colored petticoat this one time, I decided to wear dhoti pants underneath instead and it was great! It’s my little cheat now, especially when it comes to sarees made from light, slightly sheer fabrics like the Chanderi saree here. You get the volume, shape and support that a petticoat would provide, and at the same time it makes me feel much more confident in my mobility. Very important! I am wearing a Kanjivaram Saree and I have draped it in the regular left shoulder way. This is part of my mother’s wedding trousseau hence is very special to her and makes her very happy to see me wear it. I have worn sarees only on special occasions such as my school and college farewell, weddings and functions. For me, it’s a garment I associate with grandeur and festivity. The first time I put on a saree was when I was 17, preparing for my school’s Teacher’s Day. As soon as my mother finished the hard work of draping it on me, I took one step and it fell right out (quite like Deepika Padukone in Om Shanti Om)! Oh this saree was my saviour for the 2016-2017 wedding season. I had over 10 close friends getting married this year – which can be exhausting. Managing work by day – endless wedding functions by night and doing this on repeat through 1 week long weddings all through the year. This saree was a god send. It’s effortlessly easy to wear- takes all of 45 seconds and it is a sure shot Show Stopper. I have never had a night where less than 3 ladies have told me how much they love my saree. It’s as easy as 1-2-3. What I absolutely love about this saree is the simplicity of it. It’s just a crinkled fabric with two buttons and throw over the pallu. But, it has got to be one of the most impactful piece of clothing in my wardrobe. It’s traditional yet sensual, opulent yet chic. It’s different. And that’s what I love most about it. Where I would wear it- honestly Its such a versatile garment- I’ve worn it at a wedding with Indian jewellery to a black tie dinner with a blazer. I have a fondness for sarees that travels through generation in my family. My mum, my sister and I share a very special bond over our love for the 6 yard fabric. We share all our Sarees and it’s an undefined bond. But the beauty of it is we each add our own personal touch to the saree- from the drape to the additions and accessories- we each make the sraee our own- an extension of our personality when we dawn it. 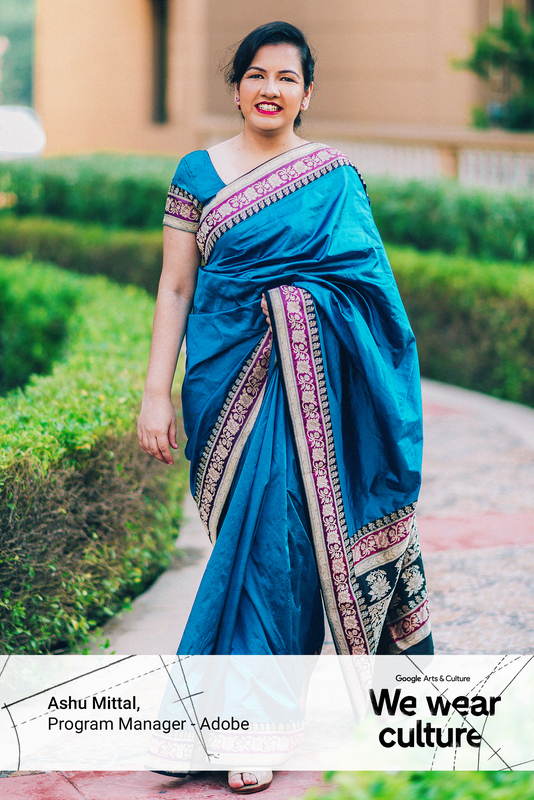 The most common sari drape – the Nivi drape. My boyfriend’s mother gave me this sari. We picked it out together, and love the combination of blue with green, pink and gold pops of color. The first time I wore it was to celebrate a big promotion she had gotten at work. As a photographer I don’t have much occasion to wear saris – though I’m always surprised by how comfortable they are. I usually wear them to weddings. I wore one for my school graduation – my friend designed it and we got it made together. It was all white and had a giant sequinned lizard on the pallu. I am wearing a traditional silk saree. This saree was part of my wedding trousseau and I bought it from Jodhpur on one of the numerous shopping trips with my mom. 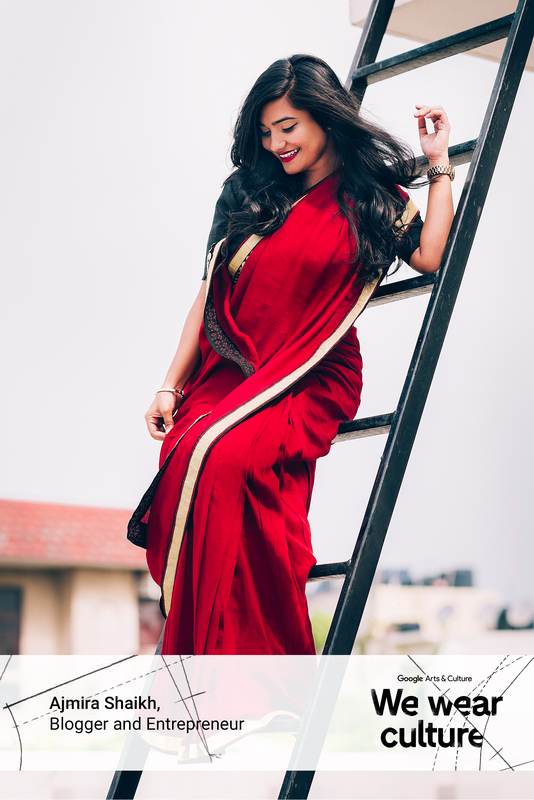 After almost a decade, while most of the other sarees and ethnic wear are in-and-out of fashion trends, this classic saree has stood the test of time and still an easy choice for an elegant look. One fun story I always remember is during my MBA when on the very first day, all women were instructed to appear in sarees for the induction program. There was utter chaos with all eighty odd of us running behind hostel housekeeping “aunties” and seniors to help with the saree draping. Nonetheless, we all learnt very quickly since saree was the uniform for 2-3 days per week and we all became proficient at draping sarees at even two minutes notice. If you’re interested in more garments, sarees and styles from ancient India, I’ve got a few interesting sections from the Google Art & Culture website. I’ve blogged about the Bhau Daji Lad Museum previously and their collection of figurines depicting textiles and attires from 19th to early 20th century from the Bombay Presidency days are very interesting. Then there’s the set of case studies on three unique Indian weaving traditions : Baluchari, Patola and Brocades. It’s called Saris, Odhanis and More: Woven Tales from India and can be seen on the Google Arts & Culture website. Can The Blouse Save The Sari is another very interesting piece. It says, “The sari has, over decades, become prosaic; however, one element of the sari appears to be changing enough to merit attention: the humble blouse.” And I agree! Blouses can be worn with jeans too! Lastly, there’s the piece that gives a brief look at regional sari drapes and textiles from India. India’s diversity extends from language, food, religion, textile and beyond. It includes varied sari drapes, developed regionally to suit ones needs. This exhibit shares a brief introduction to six saris and drapes unique to a particular region in India. It is called Regional Saris & Drapes – India. I had honestly considered wearing a saree myself and photographing this assignment but decided against it at the last minute. I guess I’ll do that some other time. Considering I’ve done more than a hundred #CoverUp personal style features on Naina.co, I have not yet done one where I’m wearing a saree! For more Google features and client gigs on Naina.co, check out the #NAINAxGoogle tag. This is such a great concept & I love all the pictures & stories.